One thing its design does not depict, however, is Mercury, the messenger of the gods in Roman mythology. The portrait on its obverse is actually that of Liberty wearing a winged cap symbolizing freedom of thought. Thus, the coin more properly is known as the Winged Head Liberty dime. But the misnomer “Mercury” was applied to it early on and, after many years of common usage, has stuck. Whatever it’s called, this dime represented a welcome change of pace when it made its first appearance in 1916. Indeed, it served to symbolize more than freedom of thought: it also was a symbol of America’s new spirit, an exuberance reflected in the freshness and vitality of the new U.S. coinage as a whole in the early 1900s. The coin it replaced, the stodgy Barber dime, was rooted in the 19th century, a time when American life was more rigid and formal. In an artistic sense this new coin was a breath of fresh air, even though its inspiration went all the way back to the ancient Greeks and Romans. Clearly, the Mint and Treasury believed it was time for a change. Under an 1890 law, they couldn’t replace a coin design more frequently than every 25 years. The Barber dime, quarter and half dollar, first produced in 1892, reached the quarter-century mark in 1916, and the Mint wasted no time in replacing all three. Actually, his misinterpretation of the 1890 law led Mint Director Robert W. Woolley to believe that he must replace the existing designs when they reached 25 years of production. The Mint began laying the groundwork in the closing days of 1915, when it set the stage for a special competition to obtain new designs for the coins. Director Woolley invited three noted sculptors—Hermon A. MacNeil, Albin Polasek and Adolph A. Weinman, all of New York City to prepare designs for the three silver coins, evidently with the intention of awarding a different coin to each artist. Whatever the Mint’s intention may have been, Weinman ended up getting two of the three coins—the dime and half dollar—with MacNeil getting the quarter dollar and Polasek being shut out. But few would quibble with the selections, for all three of the new coins—the Mercury dime, the Standing Liberty quarter dollar and the Walking Liberty half dollar—inevitably appear on most collectors’ lists of the finest U.S. coins ever made. The German-born Weinman had come to the United States in 1880 at the age of 10 and had studied under the famed Augustus Saint-Gaudens. By 1915 he had gained a reputation as one of the nation’s leading young sculptors. Weinman solidified this standing with his artwork for the dime. It’s generally believed that the Winged Liberty portrait is based upon a bust that Weinman did in 1913 of Elsie Kachel Stevens, wife of well-known poet Wallace Stevens. She and her husband were tenants at the time in a New York City apartment house owned by the sculptor. The reverse of the coin depicts the fasces, an ancient symbol of authority, with a battle-ax atop it to represent preparedness and an olive branch beside it to signify the desire for peace. With World War I raging in Europe, these were emotional themes in 1916. 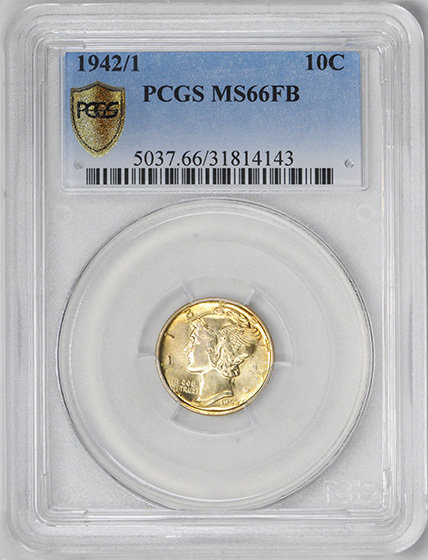 Release of the very first Mercury dimes was delayed until late in the year, as the dies were not yet ready. Coins of the old Barber design were hurriedly coined to meet the demand. 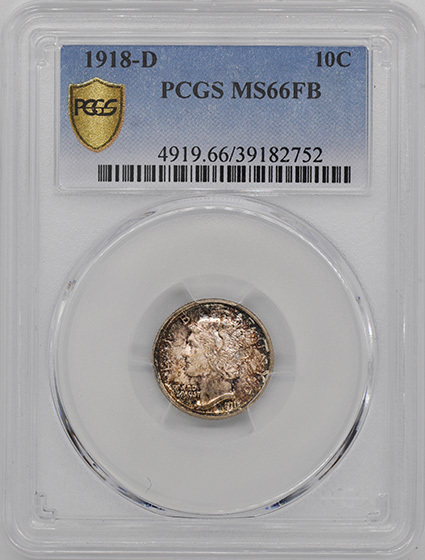 The Denver Mint made only 264,000 examples of the new dimes, and 1916-D has been the great key of the series ever since—the only coin with a mintage below one million. The mintmark appears on the reverse, below and left of the fasces. Other scarce coins include 1921, 1921-D and the 1942/1 overdates from both Philadelphia and Denver. Brilliant proofs were made from 1936 through 1942, and there exists at least one 1916 matte proof. 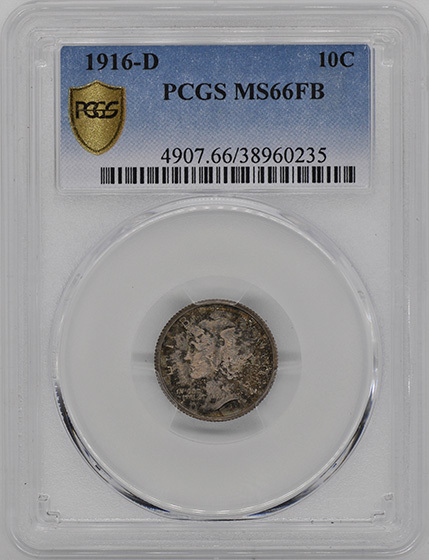 Collectors with a penchant for perfection prefer Mercury dimes with “full split bands”, completely visible lines in the bands around the fasces. For most dates these command significantly higher premiums than coins without such detail. Lack of full bands doesn’t mean a coin isn’t Mint State; often, it simply denotes a weak strike. The bands do serve as a checkpoint for wear, however, since they’re so high and exposed. Other spots to check are Liberty’s hair and the area in front of her ear. For most of the series, production at the branch mints in Denver and San Francisco was less than 10 million pieces a year. Outputs were higher at the main mint in Philadelphia but exceeded 100 million only five times. Large numbers of Mercury dimes exist in grades up to Mint State-65, and they’re readily available even in MS-66 and 67, at least for the later dates. This, combined with their beauty, makes them highly promotable. Facing 77 date-and-mint combinations, not counting the overdates, many collectors content themselves with just a single type coin. Others assemble “short sets” from 1934 through 1945 or 1941 through `45. The Mercury dime served Americans well during one of this nation’s most turbulent eras. Born on the eve of our nation’s entry into World War I, it remained an integral part of America’s coinage lineup right through the end of World War II, bowing out in 1945. Along the way, it took center stage during the Great Depression as the title coin in the down-and-outers’ anthem, “Brother, Can You Spare a Dime?” The desire of Mint Director Nellie Tayloe Ross to replace the Mercury dime with one portraying Benjamin Franklin in 1938 was delayed until after the war, Franklin eventually finding a home on the half dollar ten years later. Even in its final years, this was a coin with real buying power. Armed with a Mercury dime, youngsters in the1940s had their choice of a 52-page comic book, a double-dip ice cream cone, two Hershey bars or two bottles of Coca-Cola. Remaining in circulation right until the end of silver coinage, Mercury dimes were a familiar sight as late as the 1960s. GEM SATIN WHITE SURFACES. 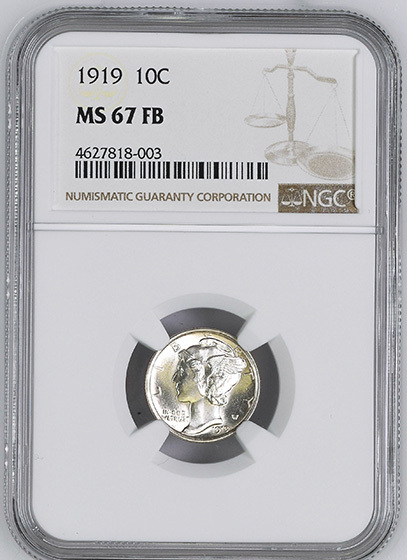 TIED WITH TWO OTHER COINS FOR HIGHEST GRADED AT NGC.